One of the most widely grown native plants, Thryptomene calycina is commonly known as The Grampians Thryptomene also as the Heath Myrtle. This is an easy care, low maintenance plant that adds colour to the garden in winter. A small shrub, with foliage is attractive year round and the added attraction of flowers appear this is a great garden plant.. 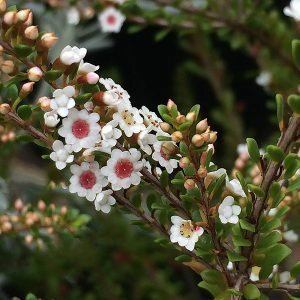 Grown commercially as a cut flower and a backing plant, used in cottage gardens and popular not only in Australia and is a Thryptomene species that is increasingly in the USA and New Zealand. It is also popular as an informal hedging plant in native gardens. Flowering from early winter through to spring, the flowers are small however they do appear in profusion. Rounded with 10 white petals, the strawberry pink centre adds to the appearance. Foliage is held close to the stem giving the plant a very neat appearance. In the right soil and position the Grampians Thryptomene is remarkably easy care. You will need a well drained soil. A position in full sun will work, although light afternoon shade is a little better. As far as we know this is a disease and pest free plant. Regular pruning will keep the Grampians Thryptomene in a more compact shape. Flowering will be improved and the structure of the plant will be stronger especially in windy positions. The best time to prune is directly after flowering. If like many gardeners you use Thryptomene calycina for cut flowers, this will suffice. Otherwise prune back as required. Height – Will reach to around 2 metres in height. Spread – Will spread to around 2 metres. Foliage – Mid green, small rounded leaves held on the stems. Foliage is aromatic and releases fragrance with brushed. Flowers – White, rounded to oblong with a strawberry coloured centres.